Has the World Reached Peak Chicken? You won’t believe how many chickens live on this planet. On Wednesday, the Northern California animal sanctuary Animal Place will airlift—yes, you read that right: airlift—1,150 elderly laying hens from Hayward, California, to Elmira, New York, in an Embraer 120 turbo-prop. Right. So obviously, this isn’t the most efficient way to spend your chicken-helping money. It didn’t take me very long to think of some alternatives: For example, you could couple all 1,150 hens off and buy each pair its own home. You could feed 367 chickens fancy organic food for an entire year. * You could feed 157 people the very fanciest, most coddled, free-rangest, organic-est eggs ever for a year. You could buy flocks of chicks for 2,500 farmers in the developing world through the charity Heifer International. 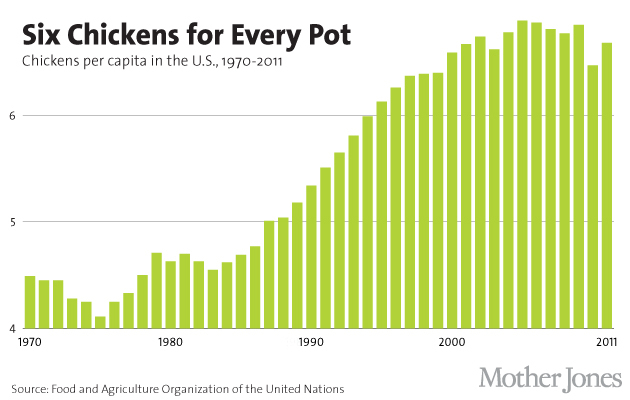 When a few other Mother Jones staffers and I heard about the spent-hens problem, it got us wondering: Has the world reached peak chicken? Considering the fact that Americans eat 79 billion eggs a year, that’s an awful lot of laying hens. And that’s to say nothing of the so-called broiler operations that make chickens for supermarket shelves and fast-food sandwiches and nuggets. According to UC Davis professor and poultry expert Dr. Rodrigo Gallardo, there are a few reasons why the world is eating more chicken and eggs than ever these days. “If you think about several years ago, most people ate beef or pork because there was more availability and because it was cheaper,” Gallardo says. But chickens have become more attractive as options over time: they’re lean, they’ve been bred over time to produce more meat, and raising them takes up much less land than raising cows or pigs. Correction: An earlier version of this article miscalculated the price of organic chicken feed. The sentence has since been fixed. Do Chicken Plant Chemicals Mask Salmonella?